A robotic rover aims to win a $30 million race to the moon by harnessing the same computing power driving today's fastest supercomputers. The graphics processing units (GPUs) made by NVIDIA would help the "Asimov" lunar rover roll safely across the lunar surface, report back its activities in real-time, and even create gorgeous lunar maps from 3D images sent back to Earth. Asimov represents the brainchild of 100 German scientists, engineers and developers, who formed the Part-Time Scientists (PTS) team to try winning the Google Lunar X Prize. "NVIDIA GPUs will be instrumental in helping us land the Asimov rover safely and allowing us to calculate a wealth of detailed information to enhance our understanding about the lunar surface," said Robert Böhme, team leader of the PTS team. "At the same time, we will demonstrate the amazing scientific accomplishments that are possible with modern, high-performance GPU technology." The Asimov moon rover as seen on a mockup of the lunar surface. 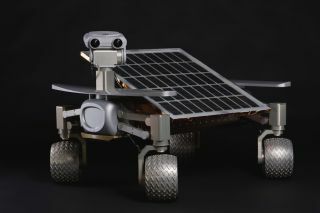 The Google Lunar X Prize's purse total of $30 million represents the biggest international incentive prize in history. Competitors who hope to win the $20 million grand prize must land a robot on the moon, have it travel 1,650 feet (500 meters) and send data and images back to Earth. Germany's Part-Time Scientists have set up NVIDIA Tesla GPUs in the Asimov rover's mission control center. The team expects the GPUs to help digest the huge volume of video taken by Asimov on the moon, as well as sending back new navigational directions. The computing power of the GPUs could even run millions of mission scenarios as simulations before launch, as a way to make the robotic mission's flight and landing as smooth as possible. NVIDIA originally made its GPUs for graphics-intensive computing tasks, such as running the latest video games. But it soon realized the GPUs could also do high-performance computing for science and business — its Tesla GPUs now power three of the world's five fastest supercomputers.